One of the tiniest artworks ever made has been unveiled by researchers. The image of the Sun is just 80 microns (millionths of a metre) wide, less than a tenth of the size of a pinhead. It was made using a novel nanoprinting technique and is composed of 20,000 gold particles, each 60 nanometres (billionths of a metre) in diameter. The printing method, outlined in the journal Nature Nanotechnology, could be used to cheaply fabricate tiny sensors and components for future microchips. "This method opens up new ways to precisely and efficiently position various kinds of nanoparticles on different surfaces," said Heiko Wolf of IBM and one of the authors of the paper. The computer giant, along with many other firms, is interested in manipulating particles at the nanoscale in its quest to shrink and improve the performance of future electronic devices. The current generation of computer chips, which start production this year, already contain transistors with features just 45 nanometres wide. IBM has previously shown off techniques for manipulating individual atoms; and the firm's researchers are no strangers to creating tiny artworks. In 1990, scientists from the firm demonstrated a method for moving individual atoms using a scanning tunnelling microscope. The first structure they created spelt "IBM". But processes like this are too expensive and time consuming to be used to mass produce products. The new printing method offers a solution, according to IBM. 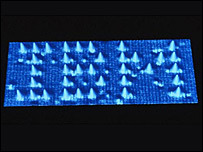 To print an image, an "ink" made of nanoparticles suspended in an aqueous solution is washed over a soft silicone template. A substrate of glass or silicon, for example, is then laid on top. The image is transferred because the ink is more attracted to the substrate than it is to the stencil. According to the researchers, the process is efficient, reproducible and can lay down combinations of different materials such as metals, polymers, semiconductors, and oxides. 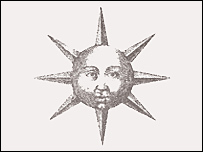 To demonstrate the capabilities of the process, the team reproduced Robert Fludd's 17th Century drawing of the Sun using microscopic gold particles printed on to silicon. Tobias Kraus, also of IBM, said that the technique produced images with a resolution "three orders of magnitude higher than in conventional printing". The firm believes the technique could be used to print nano-circuits for tiny high performance chips as well as being used to produce tiny sensors to monitor diseases in the body. "These are quite fundamental things that could go very broadly," Gina-Luca Bona of IBM told the Associated Press. The work was carried out in collaboration with ETH in Zurich.